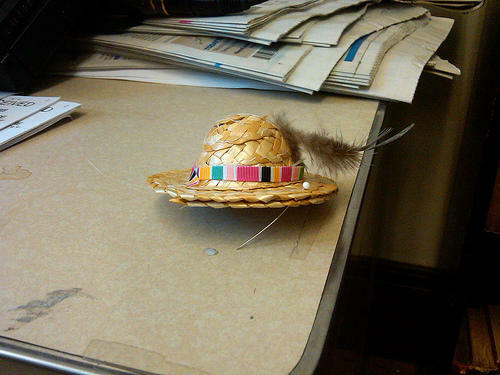 A hat-shaped party favor at a Granny D Remembrance Day event at the State House, March 10, 2011. This week marks what would have been the 103rd birthday of Doris Haddock, better known by the name Granny D.
Actress Barbara Bates Smith talks with NHPR's Brady Carlson. She made national headlines in the late 1990’s for walking across the country, 3200 miles, to highlight the issue of campaign finance reform, just ahead of her 90th birthday. Doris Haddock died in 2010 at age 100, but you might be able to hear her voice at a birthday party in her honor in Keene. Actress Barbara Bates Smith will perform as Granny D at that event, and she joins All Things Considered host Brady Carlson with a preview.